What if they launched a television station and nobody watched? The new Hasbro/Discovery partnership The Hub, which premieres this Sunday, might be a good deal for the 2nd largest toymaker in the world, but if it succeeds it’s a bad deal for parents and kids—both for what it is and what it portends. As the first television station owned by a toy company, it’s another slide downward in the increasingly greedy and lucrative world of children’s media. The Hub’s existence forces us to confront simultaneously the inadequacy and lack of enforcement of rules and laws protecting children from overcommercialization. It’s an intensification and aggregation of the growing problem of program-length commercials masquerading as legitimate children’s programming. That most children’s media are platforms for selling children toys, food, clothes, and accessories to kids is both unfair and deceptive. Media characters play an important role in children’s lives—as a source of comfort, excitement, and aspiration. It’s unfair to link those characters to rafts of products and devise marketing schemes designed to convince children that they have to own those products in order to play, or be cool, or be happy. And, in fact, children play less creatively with media-linked toys. Besides, it’s deceptive to blur the distinction between programs and ads. About choice: Actually, the last thing parents need is a slew of more media programming for kids. Between TV, the Web, video games and phone apps there are already plenty of choices among the good, the bad, and the ugly. And, on average, children are spending way too much time with screen media anyway—32 hours a week for preschool children and more than 50 hours a week for older kids. Parents following the AAP’s recommendation for screen time for children over the age of 2 would only need to find 4 half-hour programs a day for their children to watch. 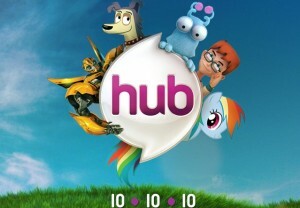 Surely between the offerings of PBS, Sprout, Noggin, Cartoon Network, the many Nickelodeon and Disney stations, and all of the movies available—there’s more than enough choice without The Hub. Less than 20% of the shows are based on Hasbro products: First of all, that’s about 18% too many. And what’s to stop Hasbro from adding more and more branded programming in the coming months and years? If the product-based shows make money, we can expect that that Hasbro will add more of them. Interestingly enough, the company’s actions imply that it believes that the shows touting their products are actually commercials. Instead of designating the standard 12 minutes of regular commercials per hour on weekdays, the station will only have six. But since the shows based on Hasbro toys, and showing the image of those toys in their content (like Transformers and Strawberry Shortcake), they are essentially 24 minute commercials anyway—way more than the amount allotted for children’s programming by the Children’s Television Act. Everybody’s doing it: It’s unfortunately true that most children’s programs, including many on PBS, generate income from brand licensing—but it’s harmful to kids that there are so few media experiences available to them that aren’t primarily an implicit pitch for a whole slew of stuff (see paragraph 2 of this piece). Hasbro isn’t the only company blatantly flouting the inadequacy of our current regulatory environment this season. Last month, Campaign for a Commercial-Free Childhood filed a Federal Communications Commission complaint against Zevo-3, a show premiering on Nicktoons which is based solely and completely on logos and spokescharacters for the shoe giant Skechers. We believe that the show violates some of the very few rules and laws we have protecting children from overcommercialization. The FCC has begun proceedings to investigate whether the show is in the public interest and has invited public comment; we’re pleased that our efforts have sparked the first national conversation about program-length commercials aimed at children in almost 20 years. I’ve worked with CCFC since its inception because I believe that we have an obligation to build a society that supports parents and encourages, rather than undermines, children’s healthy development. But social change takes time. So I hope that, in the meantime, parents decide to snub The Hub and let Hasbro know that its expansion from toys to TV just goes too far. FCC? Are you out there? Talk about conflict of interest! We still need to parent... when we begin to expect the FCC or any other govt agency to do it for us... WE fail our children.... In other words.... if you dont like what your kids are watching, get up and turn off the magic box.